Here’s a review of some of the information we just covered in our Pest, Disease and Fertility workshop Saturday February the 23rd. We discussed soil testing, understanding what the results mean and using the calculator to change the recommendations given in pounds per acre to whatever size your garden might be. There’s still time to test your soil before spring planting, although you do need to wait for it to dry out a bit first. You can read about taking a soil sample here. My test results for the high tunnel told me I needed to add all of the major nutrients-N, P, and K as well as lime. N is nitrogen which primarily promotes healthy leaves. P is phosphorus for good roots, and K is potassium for healthy fruit. If you are wondering WHY they use K: the chemical symbol K comes from kalium, the Medieval Latin for potash, which may have derived from the arabic word qali, meaning alkali. 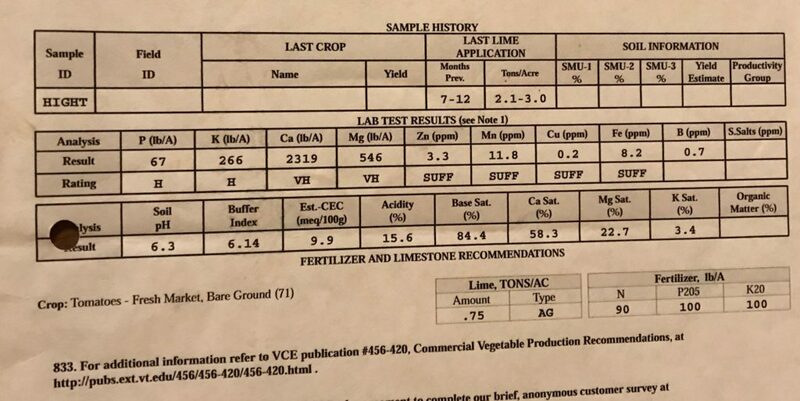 My test recommended 90 pounds (#) per acre of N, and 75# of P and 150# K. I use Harmony fertilizer with an analysis of 5-4-3. That means it contains 5% nitrogen, 4% phosphorus and 3% potassium. Or to put it another way, each pound of Harmony contains .05# N, .04# P and .03# K. I solved for Nitrogen first. So 90 goes in the 1st box and 5 goes in the 2nd box and I put in my bed dimensions of 3 X 55 feet. After clicking the “show result button”, it showed I need to add 6.82 # of Harmony per bed or .66 oz per square foot or 41.32# per 1,000 square foot or 1800# per acre to get the N required. Now I need to figure out how much P and K 6.82 # of Harmony will supply. The formula is rate per acre X 100 divided by % nutrient per pound = pounds of fertilizer per acre. In our case we don’t know the rate per acre but we know the other numbers. % nutrient is 4 for P and 3 for K and pounds of fertilizer per acre is 1800. Here’s the equation: ? x 100/ 4 =1800 lbs per acre. To solve the equation for P, multiply 4 X 1800 and divide by 100. The result is 72# P, I needed 75#, close enough. To solve for K multiply 3 X 1800/100=54. The soil test called for 150# per acre. Next, subtract 54 from 150, leaving 96# K per acre I need to still add. Back to calculator, I put 96 in the pounds per acre box. I have potassium sulfate which is 0-0-50. So I put 50 in the % nutrient box, keep my bed measurements and the result is .41# of additional potassium sulfate per bed in addition to the 6.82 lbs per bed of Harmony. This entry was posted in Crops, Workshop and tagged calculator, fertilizer, gardening, planting. Bookmark the permalink. Thanks for sharing this handy calculator!